OUR FOURTH EPISODE OF THE CATHOLIC MAN SHOW IS IN THE BOOKS! OUR FOURTH EPISODE IS CALLED “APOLOGETICS 101”. #CheerstoJesus is the new hashtag we want to start! Thank you Andrew DeJoseph and Juan Posada for answering our request in helping us with the new “Man Gear”! Special thanks to Broken Arrow Beef Jerky Outlet for your support! Flashlightz.com is going to becoming a supporter of The Catholic Man Show! Visit their website and let them know you heard them on The Catholic Man Show! ALL 3 PARTS WILL HAVE A THEME OF A VIRTUE THAT A CATHOLIC MAN SHOULD OBTAIN. This bottle costs $82.99 at Astor Wines and $85.99 at KLWines. At this price we’ve found few malts that get it this right. This scotch is actually smokier than Lagavulin, we’d say by around 15%. While it does not have quite the smoothness and balance of The Lag, the increased smokiness and peat flavor is a welcome variation and is exciting to drink. 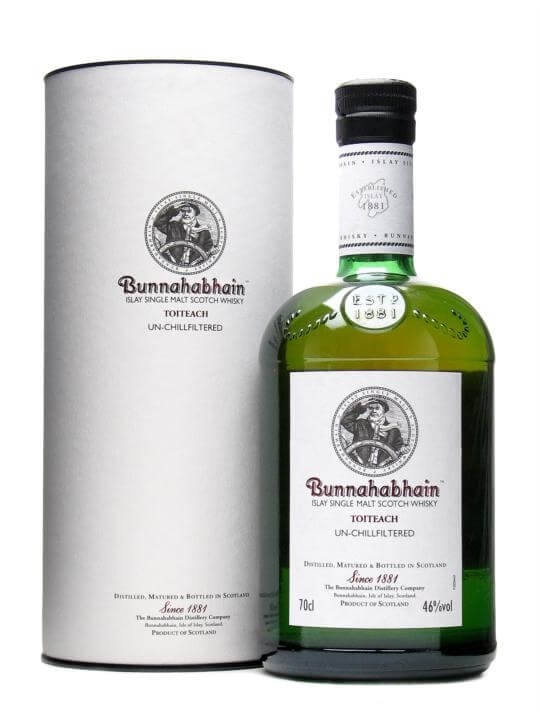 We give Bunnahabhain Toiteach an A-. If you are looking for a bottle in this range, especially something that really stands out and will add a unique dimension to your collection, this is a must have.Comparison to Other BottlingsBunnahabhain produces a number of unique bottlings under different distributors and releases. The most common are the Bunnahabhain 12-year and the 18-year. The 12-year is pretty easy to find and usually runs around $45/bottle. The 18-year is more difficult to come by (at the time of this post it is available here at KLWines and costs a premium $109.99. The 12-year and the 18-year are both very respectable scotches, however the Toiteach is a completely different whisky. The traditional Bunnahabhains have only a hint of the peat and smoke that is present in this variation. Personally, having tried all three, this one knocks it out of the park. I felt that the 18 was delicious but not quite a homerun at over $100. The 12 is a nice choice for a mellow mid-range scotch that is a bit off the beaten path. However the Toiteach is far-and-away the winner – well worth the additional cost above the standard bottle and also a much better value than the 18. Aroma: Charming peatiness with a subtle nose, prickling strength emanates from the dram. Finish: Good robust length with extremely pleasant aftertaste. Did you miss the 3rd episode? Did you miss our 2nd episode? Did you miss our first episode?